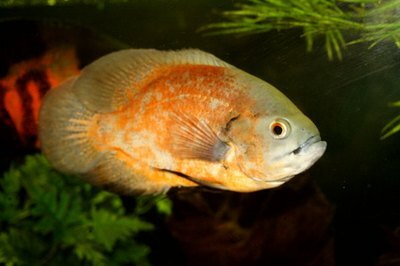 The oscar is a large, aggressive cichlid, but other members of the family stay small and peaceful. Cichlids are a huge, diverse family of fish spanning several continents. They come from extremely varied environments, from the dark acidic water of the Amazon to the clear alkaline water of the African Rift Valley lakes. While the family is known for aggression, it has some small peaceful species. Rams are a small, colorful, peaceful cichlid that hails from northern South America. They remain under three inches. A single pair will get along with other peaceful aquarium fish. Breeders have developed a number of color types, including blue, as a wild type; golden and the German blue, a mix of blue and other colors. The ram has adapted well to aquarium conditions and feeding. In your tank, rams will get along with any fish that will not harm them. The Bolivian ram, a different species than the ram, has a slightly different body shape and grows to a slightly larger size than its relative. Though usually drabber than regular rams, they do develop bright colors when breeding. They come from acidic waters in South America, but can adapt to neutral or even slightly hard water. Additionally, they get along well with other fish and accept most aquarium foods. Their hardiness, temperament and coloration make them great aquarium pets. African butterfly cichlids are a small species of cichlid from Africa. In the aquarium trade, the term "African cichlid" usually means cichlids native to the Rift Valley, larger fish adapted to hard water with aggressive temperaments. However, the African butterfly cichlid comes from West Africa and is the exact opposite: small, easygoing and not aggressive to other fish. Like many small cichlids, it will pair off and spawn if given ideal conditions: slightly acidic water and rich food. The name of the krib has an interesting history. The original Latin name was "Kribensis pulcher," "kribs" for short. Although scientists reclassified them, giving them a new name, "Pelvicachromis," the original nickname stuck. The krib is another small West African cichlid. They stay small, get along well with other fish, and a pair will often spawn in aquariums. Krib come in several varieties, including long-finned and albino strains. Several related species are also available. Apistogramma is a genus of South American cichlid related to the ram. They are not as hardy as the other fish on this list. They require meticulously clean water with a low pH to mimic the water they are habituated to in the wild. However, they stay very small (under two inches for most species) and are peaceful to the point of being shy.With more than a hundred species, apistogrammas come in a huge variety of colors, including bright reds, golden yellows and vivid blues.